Inventive, seasonal California cuisine and live jazz blend at this hip but friendly hot boîte in the Truckee Hotel. : With its bar scene, live music and sophisticated bistro ambience, Moody's is a destination for a fine, approachable meal in historic downtown Truckee. 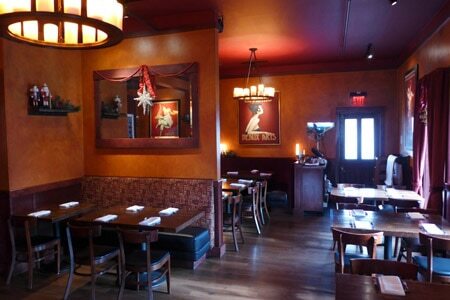 The dining room offers an intimate setting, even for larger parties. Cuisine showcases fresh ingredients from local and regional producers: think Fulton Valley Farms organic chicken served as crispy breast and leg confit, and mix-and-match oysters from New York, California and Washington suppliers. Sharable items include ahi poke and a maple-glazed pork belly. Well-regarded house-made charcuterie is a highlight. Seasonal cocktails are a specialty (Hendrick’s gin, Meyer lemon purée, muddled cucumber). The wine list proposes a thoughtfully edited selection of old- and new-world wines, and there are about 15 available by the glass.